You are bidding on a pair of Hush grey trousers. Elasticated waistband. Pockets. Barely worn. Look great on. Check out my other items. No buy it now price. No collections Grab a bargain. Happy bidding! SIZE UK 12. INSIDE LEG 26 " TAPERED ANKLE FIT LENGTH. B ra nd n ew, no t ag s bu t ne ve r wo rn. Gorgeousc re am y colourw it h bl ue and pink fl ow er s pe rf ec t fo r th e su mm er w it h a na vy o r pi nk t op t uc ke d in R RP £ 40. WALLIS LADIES BLACK STRETCH TROUSERS SIZE 10. THESE TROUSERS ARE SIZE 12 . Straight leg fit. Inside leg approx. 69% viscose, 27% nylon, 4% elastane machine washable. F & F Black Floral Palazzo Wide Leg Trousers. Size 14. Only worn a couple of times so in excellent condition. Black background with white, pink and yellow flowers. Side zip fastening. Full length. Inside leg approx 31”. Hem width approx 14”. Flat front and back. 100% viscose. Machine washable. 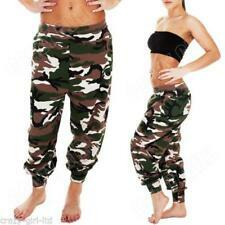 Lovely floaty trousers Dispatched with Royal Mail 2nd Class. UK delivery only. Machine washable at 40 degrees. Flower motif print on jet black fabric. black background with fuchsia & pink accents. side seam length not including waist band 41". side zip fastening. A lovely pair of summer trousers. Turn up hems eladticated waist with drawstring for comfort. Two side pockets. I'm happy to answer any queries. I post 2nd class signed for, twice a week as soon after payment as possible. If you have a moment please take a look at my other items. Many thanks. Ponte material: viscose/polyamide/elastane. Machine washable. Inside leg length: 26.5” or 67cm. Good condition.